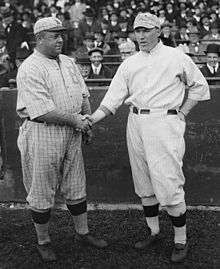 Hall of Famers: Umpire: Tommy Connolly, Hank O'Day. Red Sox: Harry Hooper, Herb Pennock (dnp), Babe Ruth. Robins: Wilbert Robinson (mgr. ), Rube Marquard, Casey Stengel‡, Zack Wheat. In the 1916 World Series, the Boston Red Sox beat the Brooklyn Robins (a.k.a. Dodgers) four games to one. Casey Stengel shone on offense for the Robins in the 1916 Series but the Red Sox pitching core ultimately proved too much for the denizens of Flatbush. The Sox's Babe Ruth pitched thirteen shutout innings in Game 2, starting a consecutive scoreless innings streak that would reach 29 in 1918. As with the 1915 Series, the Red Sox played their home games at the larger Braves Field, and it paid off as they drew a then-record 43,620 people for the final game. Brooklyn fielded some strong teams under their manager and namesake Wilbert Robinson in the late 1910s. The Robins, also interchangeably called the Dodgers, would win the pennant again in 1920, but the American League teams were generally stronger during that interval. It would be 39 years before the Dodgers would win their first World Series title in 1955. The Series had the longest game in terms of innings (14) in World Series history until Game 3 of the 2005 World Series. Until the ninth, Boston starter Eddie Shore was in control. Holding a comfortable 6-1 lead, a walk, hit batter, error and bases-full walk to Fred Merkle finally forced the Red Sox to call on Carl Mays from the bullpen to preserve a 6-5 win. The Robins scored in the top of the first on an inside-the-park home run by Hy Myers, and the Red Sox tied it in the bottom of the third, Ruth himself knocking in the run with a ground ball. The game remained 1–1 until the bottom of the 14th, when the Red Sox won it on a pinch-hit single by Del Gainer. A seventh-inning home run by Larry Gardner chased Brooklyn starter Jack Coombs and brought Boston to within 3-2. Jeff Pfeffer came through with 2.2 innings of hitless relief to save the victory for Coombs. Brooklyn's first three batters reached safely off Dutch Leonard in a two-run first inning, but that's all the Dodgers would get off him. Larry Gardner's second home run in two days was an inside-the-park one to left-center that scored two teammates ahead of him, giving Leonard all he'd need. The final game was over in a snappy 1 hour, 43 minutes. Ernie Shore threw a three-hitter. Boston scratched out a run on a walk, sacrifice bunt, groundout and passed ball. The Red Sox added more in the third, thanks to an error and a Chick Shorten RBI single, and the fifth when Harry Hooper singled and scored on a Hal Janvrin double. Casey Stengel led off the Dodger ninth with a hit, but Shore allowed no more. ↑ "1916 World Series Game 1 – Brooklyn Robins vs. Boston Red Sox". Retrosheet. Retrieved September 13, 2009. 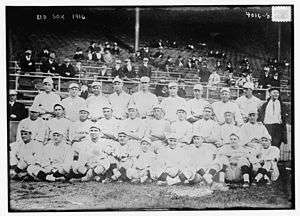 ↑ "1916 World Series Game 2 – Brooklyn Robins vs. Boston Red Sox". Retrosheet. Retrieved September 13, 2009. ↑ "1916 World Series Game 3 – Boston Red Sox vs. Brooklyn Robins". Retrosheet. Retrieved September 13, 2009. ↑ "1916 World Series Game 4 – Boston Red Sox vs. Brooklyn Robins". Retrosheet. Retrieved September 13, 2009. ↑ "1916 World Series Game 5 – Brooklyn Robins vs. Boston Red Sox". Retrosheet. Retrieved September 13, 2009. Cohen, Richard M.; Neft, David S. (1990). The World Series: Complete Play-By-Play of Every Game, 1903–1989. New York: St. Martin's Press. pp. 61–65. ISBN 0-312-03960-3. Reichler, Joseph (1982). The Baseball Encyclopedia (5th ed.). Macmillan Publishing. p. 2124. ISBN 0-02-579010-2. History of the World Series - 1916 at The SportingNews. Archived from the original on 2008.